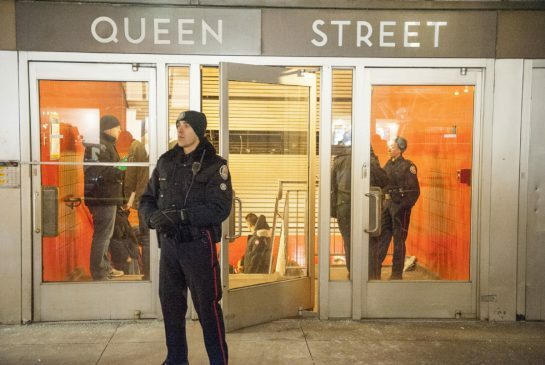 SHOOTING OF MENTAL ILL PERSON AT QUEEN SUBWAY STATION | TORONTO'S FIRST "Cop Watch"
Enough is Enough.. how many more murderers by the T.P.S in Toronto?? Yatim’s death has also sparked reviews of police use of force, and emphasized the need for ways to de-escalate situations. “His demeanor was calm, almost sad … He didn’t raise his voice, he wasn’t pointing his weapon at anyone,” said Godfrey, who was sitting less than three metres away from the man at the time. The man looked “defeated” or “tired,” he said. ← Toronto police board keeps chief’s SIU investigations secret…. Why?